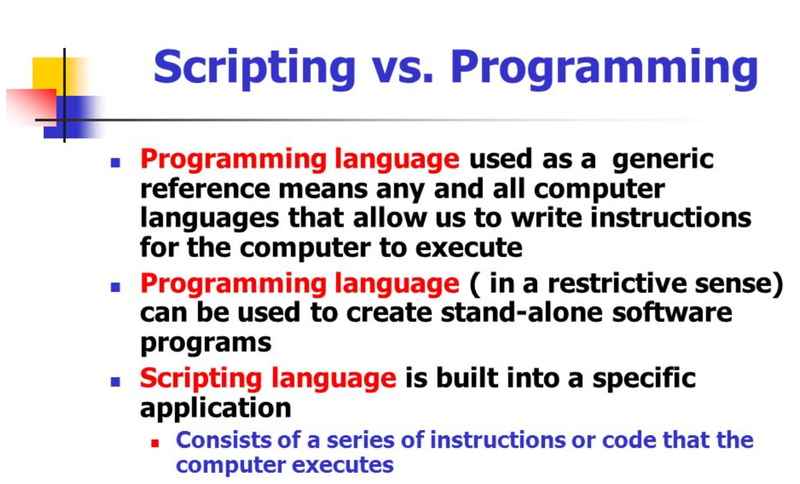 All scripting languages are programming languages. The scripting languages are a subset of programming languages. The scripting languages are usually slower than programming languages. 1. 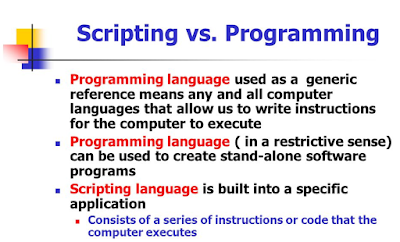 Scripting languages is an interpreter based language. 2. Scripting languages run inside another program. 5. Scripting Language is unstructured subset of programming language. 6. In the Scripting language is a programming language where almost all errors are detected at run-time. 1. Programming language is a compiler based language. 2. Programming language run independently of a parent program. 3. Programming language creates a .exe file. 4. In Programming language , you have to compile program (C, C++, Java, C# and others) before you can run it. 5. Programming Language is compiled to machine code and run on the hardware of the underlying Operating System. 6. In the Programming language almost all errors are detected at compile time. What Is Difference between a Compiler and Interpreter? A Compiler is a translator which transforms source language into machine language. An Interpreter is a program which imitates the execution of programs written in a source language. An Interpreted language is any programming language that isn't already in “machine code” prior to run-time. So, Python will fall under byte code interpreted and the “.py” source code is first compiled to byte code and this byte code can be interpreted or JIT compiled.